The Great Shasta Rail Trail will link the towns of McCloud and Burney and nearby recreation areas along an 80-mile trail that will feature local heritage, scenic landscapes, and stimulate the economic and social vitality of the region. Back in the days when the McCloud Railway Company hauled logs and freight between McCloud and Burney, rail service was a vital transportation link between these two communities. The McCloud River Railway Company began operation in 1897 and stimulated the growth of McCloud and Burney as thriving sawmill towns. Now imagine this historic railroad becoming one of California's premier long-distance trails for all to use and enjoy. You are invited to share our vision to transform 80 miles of railroad bed to the Great Shasta Rail Trail (GSRT). We envision the development of trailheads and other visitor facilities that welcome public use, including future trail connectors to year-round recreation opportunities for hikers, bicyclists, equestrians, and other uses. When fully developed, the GSRT will offer an array of recreation opportunities that will promote healthy lifestyles through exercise, interpretation and education, and trail stewardship activities. The GSRT will be a place of discovery with fascinating tales to ell. Interpretive sites along the GSRT will foster awareness, appreciation, and protection of the trail's natural, scenic, cultural, and historic resources. This new recreation resource will boost the economic vitality of the area. Community involvement in the acquisition and future management and maintenance of the trail is vital. Together, we can make the GSRT a reality. This project has been pursued by volunteers from several organizations that serve the people of this region, notably Save Burney Falls, Shasta Land Trust, McCloud Local First Network, the Volcanic Legacy Community Partnership and the McCloud Trails Association. Our work has been supported by the Shasta Regional Community Foundation, the Rails to Trails Conservancy, and the Rivers, Trails, and Community Assistance program of the National Parks Service. 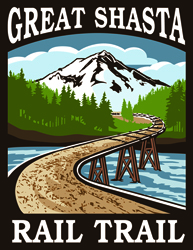 For more information on this exciting project, please visit the Great Shasta Rail Trail Association.